It’s hard to pick a point to start, but I guess the figures are as good as any. These are well made and like Skylanders toys, they are a bit overpriced. 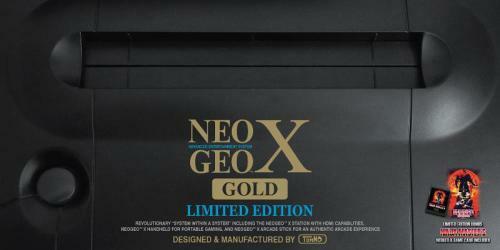 Unfortunately the toys are extremely limited in what you can do with them compared to other interactive figure games. For example, with Skylanders, your figures have different abilities, can be used on any level, and as you level them up, you can customize them to a degree and watch their stats and abilities change. You can also use any figure at any time and the game is fine with that. With Disney Interactive, none of that is true. You can only use specific characters with each toy set. So Captain Jack Sparrow can’t be used with the Monsters University world and Tonto can’t play with Cars. 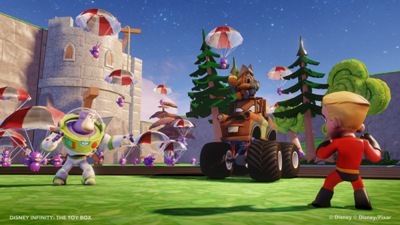 You can interact with the Little Big Planet-esque or Toy Story 3-esque “Toy Box” where you design your own world/level, but that still means the figures have very limited use compared to similar games. Even worse, leveling up is Disney Infinity conveys nothing new for the character in question. A Level 1 Mr. Incredible is exactly the same as a Level 13 one. You earn a star for leveling up though which gives you a shot at a random item to use in Toy Box Mode. That’s pretty uninspiring when compared to what all you can do with Skylanders or Pokemon Rumble U figures. Worse yet, because there is no real bonus from purchasing extra figures, owning these unmoving (but well molded) pieces of plastic that are sold separately from the core game actually brings nothing to the table. 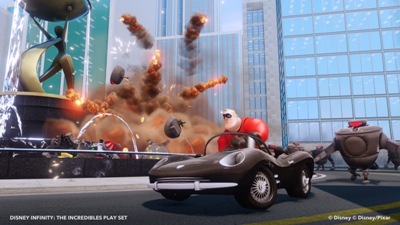 Sure Dash will have different attacks from Violet, but The Incredibles world will still play the same and the end boss will be exactly the same to a T regardless of who you use. 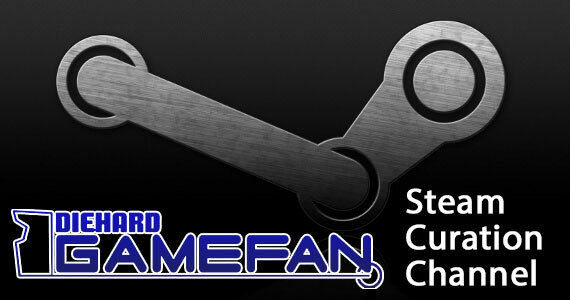 I should also point out since I’m reviewing the PS3 version, there are some trophies you can only earn by purchasing extra content – something that you don’t have to do with Skylanders. So really, aside from the single three minute or so Adventure that is specifically tied to a figure, Disney Infinity didn’t really need to be a figure interactive game because it possesses none of the actual reasons or gimmicky gameplay that makes the figures important to the overall game. If this had just been a collection of three six hour platformers and a world building mode, no one would have known the difference. Instead, it just became a pure cash grab rather than a game where the figures actually matter. Then there’s the game itself. 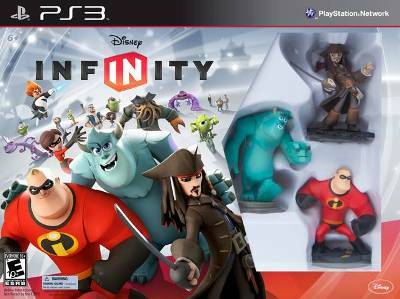 As mentioned Disney Infinity is three platformers where the other figure interactive games are beat ’em up button mashers. So if you are looking for a similar game mechanics and style wise, you won’t find that here. I actually approve of the three platformers and the world builder option as that’s a lot of content. Most platformers are under ten hours for a full budget release and here you’re getting three of them. On paper, that MORE than makes up for how limited the figures are compared to similar style games. Unfortunately the platformers are pretty buggy. You have to download the patch 1.01 to even make the PS3 version of Disney Infinity playable. Even then, the game is now on patch 1.05 and while Pirates of the Carribean plays exceptionally well and is a lot of fun, both Monsters University and The Incredibles are filled to the brim with bugs. With Monsters University, there are some rendering and anti-alias issues but more importantly, some quests don’t trigger correctly or show up on your screen at all. This would be fine if they were optional subquests, but it happens only with the core story progression quests. This means you’ll get a “Go to the clock tower” command repeated, but the quest won’t show up in your list of things to do and the quest that is supposed to occur when you get to the clock tower won’t trigger until you go and come back repeatedly. This is exceptionally frustrating to a gamer of any age, but for younger gamers, this will probably make them not ever want to play the game again. The Incredibles is buggy but in a very different way. You have enemy respawns the level of which I haven’t seen since Evil Dead: Hail to the King. You know, that video game that is often listed as one of the worst ever made? You also have collision detection issues and some quest detection issues, but thankfully the quest problems seem to be only with sub or sidequests. The final boss battle is pretty buggy though and your character will sometimes fall to their death even when not hit by anything or an item you chuck at Syndrome will freeze in mid-air and just sit there for a while instead of completing its intended journey. All in all, the game was released way too early and the fact two thirds of the play sets are this buggy even after patch 1.05 is pretty inexcusable. Had I reviewed this back in August, I’d probably be even more scathing in my commentary. So while these two big issues should have you looking at something else for the holiday season, sometimes you or an intended gift recipient will still only really want this and ignore the huge red flags. So if we ignore the bugs, the fact the figures don’t actually do anything except get you to spend more money and it’s the second rate love child of Skylanders and Little Big Planet, what is there to LIKE about Disney Infinity? Well, it’s a chance for a Disney fanatic to get to play video games based on some of their favorite recent characters… and Jack Skellington. He’s the most veteran character playable in the game. Love of Disney goes a long way and some of these characters have never had a video game, so this is your first chance to play with or as these characters. Sometimes the love of a licensed brand outweighs even the buggiest games. We’ve seen it throughout gaming history. The stories for each platformer are cute too. They are nothing to write home about but they’re enjoyable enough to keep you going through the motions. 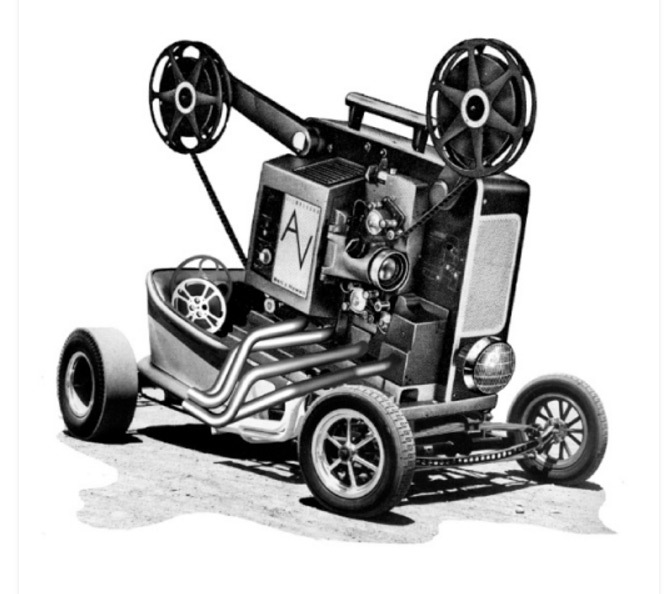 They’re generally rehashes of the movies – beat Syndrome’s crazy scheme, take down the Kraken and Davy Jones and do frat pranks to another university. The stories of each game are little more than window dressing to the overall experience, but they tie each Play Set together enough that you’ll have fun with what is there and get some overarching plot for the events to boot. The visuals of the game are also decent. While the level of detail and animation to Disney Infinity isn’t at the high end of what you would expect from a modern console, the game looks better than what you’d find on a PS2 or Xbox and are generally in-line with the usual visuals of a mid-tier quality game. I’m a bit disappointed that the approved screenshots for the game Disney is making review sites use are NOT of the actual quality you’ll see in the game. Pity. There aren’t a lot of character models in the game (although a lot of skins for the NPC “toys” are there) and the graphics aren’t as impressive as other Disney games that came out this year like Castle of Illusion, but children and Disney fans will be happy with what’s here. The audio aspects of Disney Infinity are odd. They don’t actually use music from the movies, but rather music that sounds like it could be leftovers from the soundtrack. It’s a bit odd. They should have been able to use the core music from each movie. I mean, Rise of the Underminer had actual Incredibles music and Lego Pirates of the Caribbean had all the familiar catchy music from the films, so why didn’t Disney Infinity? I have no idea, but it’s very perplexing. Likewise, they were unable to get many voice actors to reprise their characters. Jared Butler does Jack Sparrow’s voice here instead of Johnny Depp. Likewise Billy Crystal, John Goodman, John C. Reily, Tom Hanks, Tim Allen and many others are replaced by (cheaper?) sound-alikes. They do an okay job, but it’s obviously not the original actors for each character. That said, some people did come back like Craig T. Nelson as Mr. Incredible, Sarah Silverman as Princess Venellope, Chris Sarandon as Jack Skellington and Mandy Moore as Rapunzel. Hearing the sound bytes from these characters it sounds like their lines were ripped directly from the movie rather than being new recorded material for the game, but I’m going to be optimistic and say it is. After all, why not do that for everyone then? Still, the mix of returning and declining characters is an odd one and like the music, makes the aural bits of Disney Infinity feel somewhat off. Playing Disney Infinity is also a mixed bag. The general running and jumping of the game is fine. Combat is iffy due to collision detections. Stealth based bits in Monsters University are all over the place. You can be facing a person looking for you and have nothing happen but then be in an area where there is literally nothing but you and shadow and somehow be seen. Piloting boats is a bit awkward due to size, but the driving controls are pretty tight. Piloting a flying vehicle like Dumbo or a helicopter just might be the worst experience I’ve ever had trying to drive in any video game. The controls are just terribly done and not at all intuitive. Thankfully you rarely ever have to do any of this but when you do, it’s profanity inducing. In playing the play sets, you’ll find each to be pretty easy but the experience gets bogged down by bugs, bad controls, the occasional freezing up and quest detections. As I said earlier, Pirates plays the best and it pretty good on its own (although the Lego video game with the same license is far superior) and while the other two have their moments, the bad outweighs the good. There is little replay value to either unless you are trophy hunting or trying to get stars to unlock new items for the toy box, and that’s a bit disappointing too. Then of course there is the Toy Box, which has a lot of potential, but that few gamers will actually make use of. 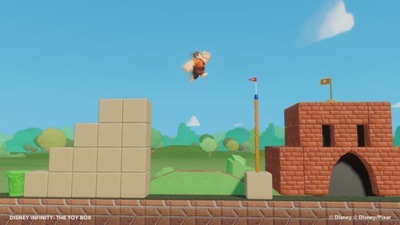 Here you design your own levels to play in and to put online for others to download. There are some great free levels available online, like a bunch of Ducktales themed ones, but for the most part, there’s a lot of badly designed rushed stuff. It’s like RPG Maker, Little Big Planet and other games where you design levels (or CAWS for you WWE fans) for friends and random strangers – most is mediocre to sub-par, but there are some great levels hidden amongst the crud. Some that I’d say are better than the Avalanche designed worlds. Of course, you have to have the desire to make levels to get any use out of the Toy Box – otherwise it sits their unused and unloved unless you are trophy/feat hunting, which kind of flies in the face of the Toy Box to begin with. I personally didn’t care for the Toy Box due to the randomly earning parts (most of which are useless) and felt the ESPN branding of anything sports related was a bit tacky. Other gamers, especially those who fall in love with Disney Infinity, will find this a far more rewarding experience and easily the crown jewel of the game. Plus it’s the only place where you can have Mater from Cars meet Wreck-It Ralph. Toy Box Mode is what you make of it but unfortunately most people won’t be able to take advantage of it to its full extent and those that try still have to get pieces for their worlds in a random fashion. Ick. So overall, I’m not sure how this game has done as well as it has or received that many positive reviews. The toys don’t really serve a purpose compared to other figure interactive games, the Play Set worlds are one and done affairs and aren’t as good as other platformers on the market. Toy Box Mode is limited compared to Little Big Planet, the game is still extremely bug ridden months after release and the both the audio and visual components of the game, while acceptable, are nowhere as good as they could have been. I’m extremely disappointed in Disney Infinity and can honestly say any of the Skylanders games blow this out of the water. Of course, I’m lucky enough to have reviewed the PS3 version. The Wii version is even more limited and the 3DS version is like Mario Party. I know I’m too late to say this to most of you but – save your money; Disney Infinity simply isn’t worth it. Disney Infinity is an attempt to mash up Skylanders and Little Big Planet but it ends up being far more limiting than either of those games. Toy Box is cute, but unlocking items for it is far too random and aside from Disney branding, there isn’t a lot there to work with unless you want to put dozens of hours in to collecting stars. 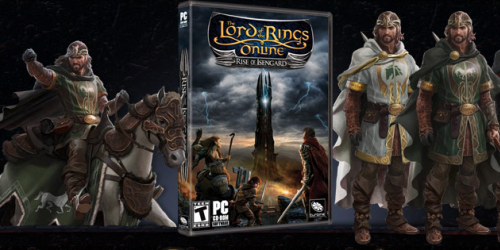 The figures actually don’t add anything to the game, except to act as locked on disc content. Unlike Skylanders or Pokemon Rumble U toys, they neither grow nor gain new abilities. Leveling up is a number and nothing more. 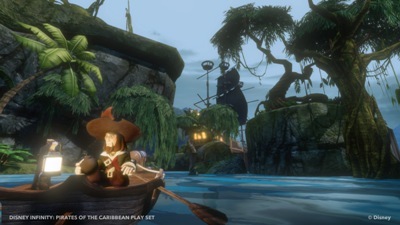 The Play Set platformers range in quality from very well done (Pirates) to extremely buggy and poor done (Monsters & Incredibles). Disney Infinity ends up being an example of how to ape a popular genre but just not living up to the progenitors of the interactive figure market. This was liking playing Pit Fighter after experiencing Street Fighter 2. Nah, we didn’t actually request this. Actually, they specifically came to me and said “Alex, will you review this?” in late November. Plus, if you take a look at everything from the n4g thread about this post (http://n4g.com/news/1410593/diehard-gamefan-disney-infinity-review) to Amazon.com user reviews (http://www.amazon.com/DISNEY-INFINITY-Starter-Pack-sony-playstation3/product-reviews/B00AXI9XIE/ref=cm_cr_pr_hist_1?ie=UTF8&filterBy=addOneStar&showViewpoints=0&sortBy=bySubmissionDateDescending) you’ll see a lot of negativity towards the game. PLUS, Disney Interactive even warns the game can not be played at ALL on older PS models like the original 40/60/80 gig systems. I’m lucky I have the shiny white 500 GB version. Which again goes back to the fact the game was not really designed very well.